Marcus & Millichap recently traded a 20,100 SF mixed-use asset in Lansdale, PA. The sale included two properties, totaling 14 apartments and four commercial spaces. LANSDALE, Pa., June 30, 2017 – Marcus & Millichap (NYSE: MMI), a leading commercial real estate investment services firm with offices throughout the United States and Canada, announced the sale of 303-305 West Main Street and 306 Madison Avenue, a 20,100-square foot mixed-use asset located in Lansdale, Pa.
Daniel Bernard and Philip Sharrow, investment specialists in Marcus & Millichap’s Philadelphia office, had the exclusive listing to market the property on behalf of the seller. The pair along with Andrew Townsend, first vice president investments, procured the buyer. Brenton Baskin served as Marcus & Millichap’s broker of record in Pennsylvania. 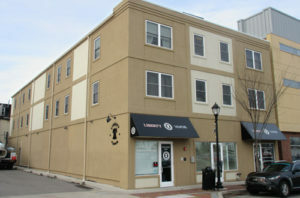 The sale included 303-305 West Main Street and 306 Madison Avenue in downtown Lansdale, Pa., totaling 14 apartments and four commercial spaces. In 2013 the owner completed the 306 Madison Avenue addition, adding ten apartments and one commercial unit. Following the addition, half of the older apartments were extensively renovated. The new and renovated units feature stainless steel appliances, granite counter tops, in unit washer/dryer combinations and hardwood flooring. The buyer plans to continue the renovation process to increase cash flow.